Preview of LiveU's video transmission solutions at IBC 2016. Hackensack, NJ, July 2016: Celebrating 10 years of innovation, LiveU continues to set the standard for high-quality and reliable live video acquisition, management and distribution over IP. Since disrupting the broadcast market with cellular bonding, LiveU remains at the forefront of the tech evolution, transforming the way broadcasters and online video content creators produce, integrate, and share high-quality streaming content. At IBC2016, LiveU will be making a major product announcement, once again taking live IP video up to a new level. LiveU’s full range of live IP video solutions will be on show. Launched successfully in the US, LiveU will showcase LiveU Solo, its plug-and-play live streaming bonded solution for the online media market. LiveU Solo allows users to livestream seamlessly into any web streaming workflow by connecting automatically to popular OVPs and content delivery networks such as Facebook, YouTube Live and Wowza Streaming Cloud™. Solo is simple to manage and control remotely via a web interface or smart device. LiveU will present its next-generation LU710 4K/p60 HEVC rack-mountable 1U encoder. Combined with the Xtender transmission device (LiveU’s external antenna with six modems, delivering video rates of up to 40 Mbps) and LiveU’s enhanced server with 4K output, the LU710 encoder transforms any SNG truck into a fully mobile hybrid cellular/satellite solution for transmitting 4K/HD video with improved efficiency. LiveU will be presenting Version 6.0, a major software release for its full range of portable transmission and management solutions. 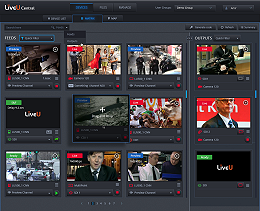 Version 6.0 includes a new intuitive interface design for LiveU Central, LiveU’s cloud-based management and video distribution system, and an improved LiveU Matrix management workflow, where operators can manage all LiveU IP feeds and outputs from a single screen, handle multiple live streams simultaneously, and easily allocate specific live feeds to designated channels. In addition, this release includes an enhanced version of MultiPoint, LiveU’s internal and cross-organisational professional video distribution service, which enables the sharing of high-quality live video between multiple broadcast facilities over the public Internet. Key benefits for version 6.0 include: workflow integration with MPEG-TS output from the LU2000 server, enabling broadcasters to connect their IP stream seamlessly to MCR and other third-party equipment; least-cost bonding, enabling users to prioritise the usage of cellular vs satellite (and wired Internet) in order to optimise their data costs; improved streaming algorithms and support for higher bandwidth for higher video quality, stronger resiliency and faster file transfer. Version 6.0 also includes a software upgrade feature which allows customers to upgrade their LiveU units and servers to new versions and fully manage the process themselves. Full product demonstrations of LiveU’s solutions for the acquisition, management and distribution of live video will be available at Stand 3.B62.